Catching a Spokane Indians game means different things for different fans. Some like the game. Some like the atmosphere. And some like the mascots. For fans in that last group, Sunday’s 4-3 victory against the Vancouver Canadians might have been even more special because of a certain Spokanosaurus. It was Otto’s birthday – the blue reptile, not the senior vice president for the team who shares the same name, but not the same moves. The mascot, who made his debut in 1993, turned 8 years old this weekend. If that math doesn’t add up right, it’s because it doesn’t. And for those wondering how he can celebrate his eighth birthday – again – all you have to do is ask. And he’ll hold up all of his fingers. All eight of them. Now you have your answer. Plus, the human Otto is quick to point out that his link to his bluer, rounder counterpart wasn’t up to him … but the fans in an open-vote naming contest. “Dinger, Snooter and Grounder were the three final names. Andy Billig, the president of the team, put in my name in as a joke and it ended up winning,” Klein said. The perpetually 8-year-old Spokane icon has gained both a following of fans and a few furry friends of his own. Otto wasn’t alone on his birthday. The team’s other mascots were there to celebrate with him. Doris the Spokanosaurus completed the dino duet with her introduction in 2011. The Indians also added Recycle Man in 2009, with RiBi the redband trout joining the ranks in 2017. Each mascot has served a distinctive purpose for both the team and the community. “The initiative with Otto was to create an identity for the team,” Klein explained. “The initiative for Recycle Man was to put a face on the Avista Stadium recycling campaign and Doris was meant to appeal to the younger female crowd. “With RiBi, it’s to help raise awareness for the beautiful redband trout in the Spokane River,” Klein said. 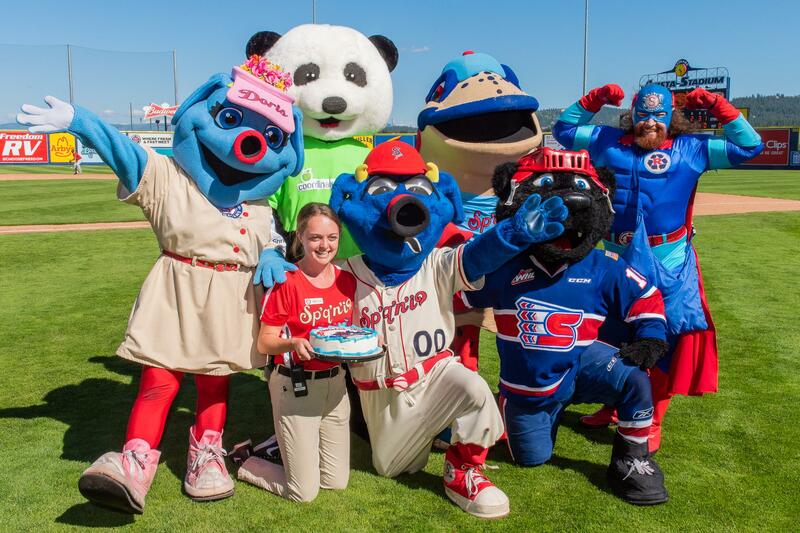 Together, this squad of mascots lead the Northwest League in gladding-average and fun-driven-in. And each character – including a few guests like Boomer Bear from the Spokane Chiefs and CC the Panda from Coordinated Care – joined the crowd in singing “Happy Birthday” to the dino-of-the-day (raptor of the hour?) in the third inning. The big, blue reptile with style knows how to throw a prehistoric party. “The fans love them, so we love them,” Klein said with a smile. Published: June 24, 2018, 10:35 p.m. Updated: June 24, 2018, 10:48 p.m.